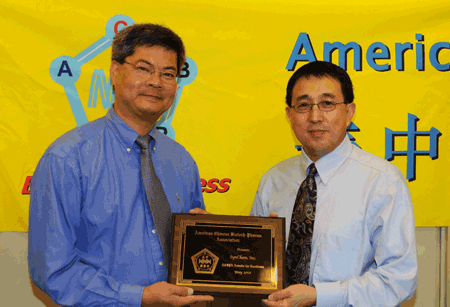 SynChem, Inc. is proud to announce today that it receives an award from the	American-Chinese Pharma-Biotech Association (ACPBA). SynChem, Inc. is proud to announce today that it has upgraded the kilo lab in the Elk Grove Village facility. The upgrading of the kilo lab includes installation of two 8-foot walk-in fume hoods and a sophisticated stockroom. The kilo lab currently equips with a Chemglass 30 L Jacketed Reactor with a Julabo F55 chiller system, a Chemglass 50 L Jacketed Reactor with a Julabo F55 chiller system, and a Waters HPLC system. SynChem, Inc. is proud to announce today that it has set up Central Analytical Chemistry Labs both in the Elk Grove Village facility and in the Shanghai branch. The Central Analytical Chemistry lab in Elk Grove Village now equips with a Varian 300 MHz NMR, an API 150EX LC-MS, a HP G1315B DAD HPLC-DAD, and two Waters HPLC systems. The Central Analytical lab in Shanghai is equipped with a Varian 300 MHz NMR, a Fisher Thermo LC-MS, a Semi-preparative HPLC, two HPLC systems (Gilson and Shimadzu), and a CEM Explorer MicroWave Reactor. The setup of the central analytical labs will greatly improve both sites’ productivity and efficiency. SynChem, Inc. is proud to announce today that it has finished a half million dollars renovation of its facility and has purchased series of new equipments. "This is our continuing efforts to upgrade our facility and equipment in this extremely challenging financial environment, I am confident that our business model is well developed and our chemists are enabled by the state-of-art equipments and facility." Said Dr. W. Paul Mar, CEO of SynChem, "also it shows the financial strength of SynChem building up in the past 12 years. This investment enables us to upgrade our research chemistry services more efficiently and broaden our service scope." The facility upgrade involves installation of three 8-foot fume foods, two hazardous materials stockrooms, a new water treatment system for its laboratory, a new NMR room, and a new analytical chemistry laboratory. The equipment upgrade includes purchases of a Varian 300 MHz NMR, an API 150 EX LC-MS, a HP G1315B DAD HPLC-DAD, a ChemGlass 30 L Jacketed Reactor with a Julabo F55 chiller system, a Chemglass 50 L Jacketed Reactor with a Julabo F55 chiller system.